For many companies, the ability to control energy costs and sources is a key factor when deciding where to locate or expand their operations. Increasingly, companies are specifically seeking opportunities to purchase advanced energy—a choice often backed by an internal sustainability goal or renewable energy target. However, in states across the country, policy or regulatory roadblocks leave companies with few options, if any, to meet their needs. 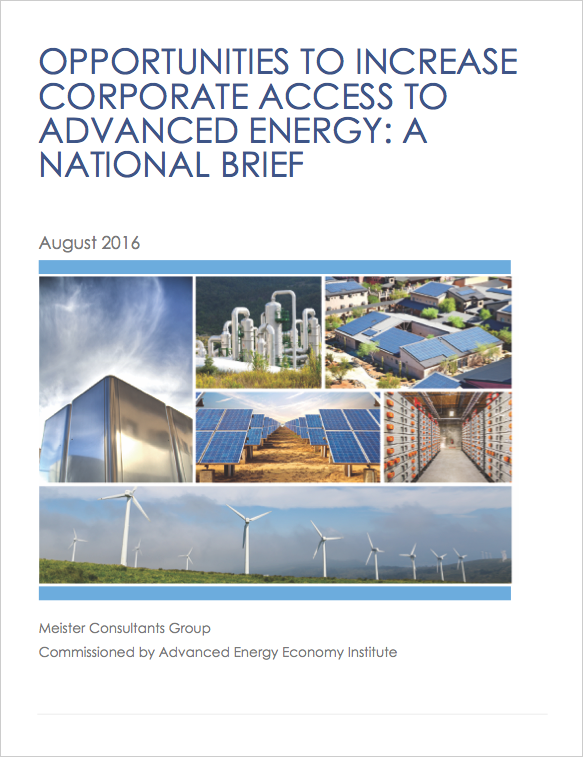 To understand these barriers and opportunities at the state level, Advanced Energy Economy Institute commissioned Meister Consultants Group (MCG) to assess policy changes that states can enact to expand corporate access to renewable energy. The report identifies 11 states with a strong corporate presence in which one or more of the policies profiled has the potential to create new opportunities for corporate competitiveness: Alabama, California, Florida, Georgia, Indiana, Kentucky, Michigan, Minnesota, North Carolina, Ohio, and Texas. Applicable policy options for each state can be found in the Executive Summary.